Apple is building a new flagship retail location in Chicago, which features glass walls and a thin, carbon fiber roof. 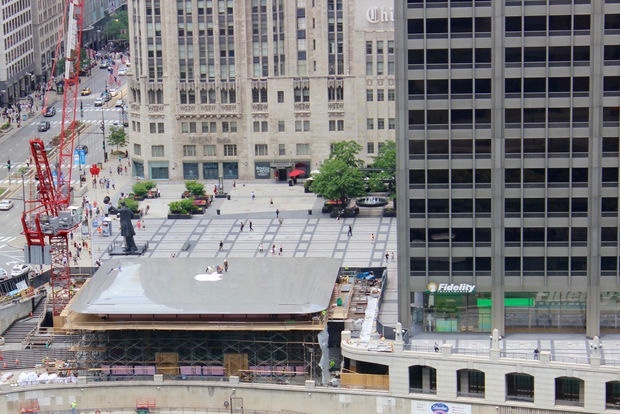 Photos of the store's roof were shared today by Chicago news site DNAinfo, and as it turns out, Apple has added a white Apple logo that wasn't in the original plans, making the top of the structure look a lot like an Apple notebook. The roof is made from a material that resembles the silver aluminum of the MacBook and MacBook Pro, with rounded edges and the same rectangular shape. When complete, it will sit atop all-glass walls, making for a unique floating MacBook-style design that's not quite like any other Apple Store. The new store, which is located near the historic Michigan Avenue Bridge alongside the Chicago River, has been designed by longtime Apple partner Foster+Partners in homage of architect Frank Lloyd Wright's Prairie Style homes in Chicago. Based on plans from 2015, the building spans 20,000 square feet and replaces a vacant food court. It features two floors, with a flight of stairs that go from street level to a walkway next to the north bank of the river. There is no word yet on when the new store will be opening, but construction is nearing completion. Next year the store will be half as high, close after 4 hours and have only one door. Terrible decision for a roof. MacBooks are prone to water damage. 480p? Was the video shot with a potato? Haha this is completely absurd. I wonder if this wasn't originally planned and one guy said, "You know...the roof kind of looks like..." and Tim said, "Say no more fam." Commitment to the Mac - like it! Kind of whimsical for the bauhaus obsessed Apple.